Friday, May 26th: 11am-7pm, Faery Hair Friday at the Fernie Brae, 4035 SE Hawthorne, Portland, drop in! Thursday, June 1st: 1-5pm, First Thursday Faery Hair at Kyra's Bakeshop, 599 A Ave in Lake Oswego, drop in! Friday, June 2nd: 11am-7pm, Faery Hair Friday at the Fernie Brae, 4035 SE Hawthorne, Portland, drop in! Friday, June 9th: 11am-7pm, Faery Hair Friday at the Fernie Brae, 4035 SE Hawthorne, Portland, drop in! 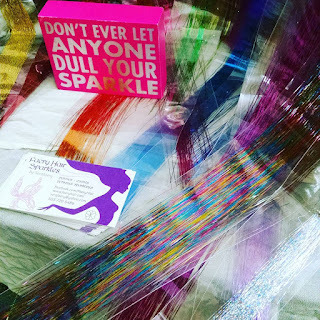 Thursday, June 15th: 3-6pm, Faery Hair at Made You Look children's shop, 2418 E Burnside St, drop in! Friday, June 16th: 11am-7pm, Faery Hair Friday at the Fernie Brae, 4035 SE Hawthorne, Portland, drop in! Friday, June 23rd: 11am-7pm, Faery Hair Friday at the Fernie Brae, 4035 SE Hawthorne, Portland, drop in! Friday, June 30th: 11am-7pm, Faery Hair Friday at the Fernie Brae, 4035 SE Hawthorne, Portland, drop in! May is pretty much filled except the last Saturday, and I'm starting to get requests for weekends in June and July, contact me at serafaery@yahoo.com or 503-720-5486 for your event or gathering! Friday, May 12th: ***new longer hours! *** 11am-7pm, Faery Hair Friday at the Fernie Brae, 4035 SE Hawthorne, Portland, drop in! 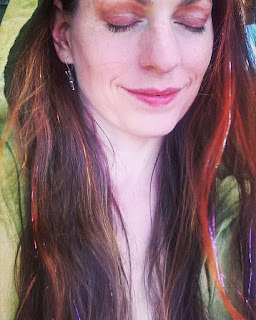 Saturday, May 13th: 12:30-4:30pm, Faery Hair at Sweet Siren Boutique, Progress Ridge, 12325 SW Horizon Blvd, St 31, Beaverton, OR, drop in! Friday, May 19th: 11am-7pm, Faery Hair Friday at the Fernie Brae, 4035 SE Hawthorne, Portland, drop in! May the Forth be with you, and a Television appearance! So much excitement! And there's more! The faeries are conspiring with me! Thursday, May 4th: 1-5pm, First Thursday Faery Hair at Kyra's Bakeshop, 599 A Ave in Lake Oswego, drop in! Friday, May 5th: ***new later hours! *** 11am-7pm, Faery Hair Friday at the Fernie Brae, 4035 SE Hawthorne, Portland, drop in! Saturday, May 6th: 11am-3pm, friend Sarah (yes, a different Sarah!) 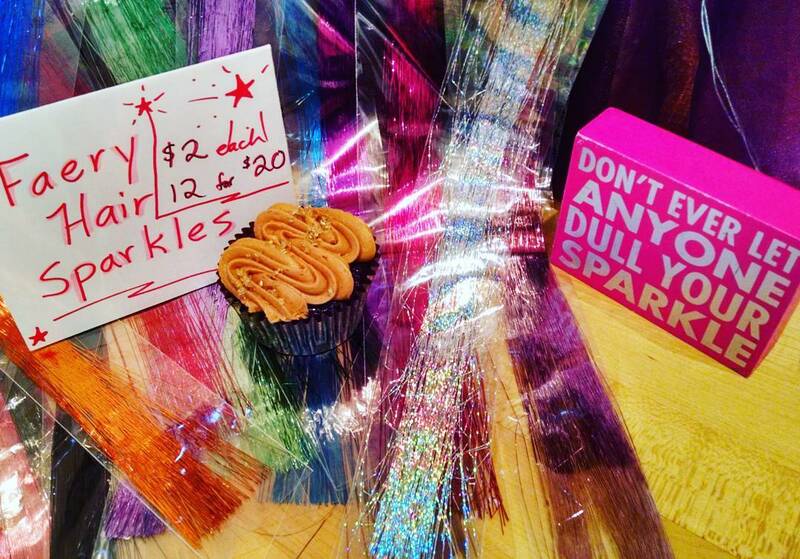 will offer Faery Hair for the 1st Anniversary party at the Prosperity Pie Shoppe in Multnomah Village, 7814 SW Capitol Hwy, drop in or call them to sign up for your favorite timeslot with Sarah: 503-207-6664 - I'll be sparkling there Sunday! Monday, May 8th: 12pm, Sera will feature Faery Hair Sparkles on KGW's channel 8 for Portland Today! Saturday, May 13th: 12-4pm, Faery Hair at Sweet Siren Boutique, Progress Ridge, 12325 SW Horizon Blvd, St 31, Beaverton, OR, drop in! Blessed Beltane, safe flight over the fires!